New York-raised, long-tongued rock icon Wwill make Broadway debut and triumphant homecoming if he lands the role. 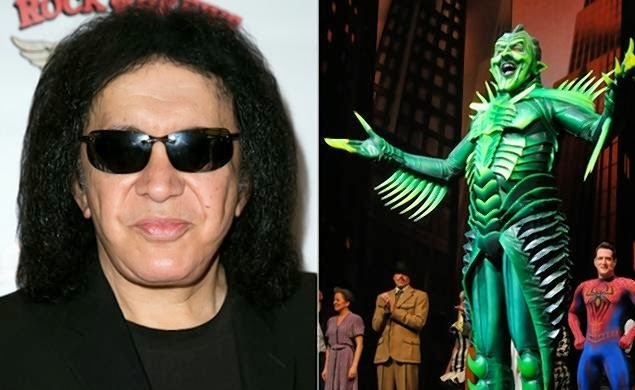 Gene Simmons set tongues wagging Wednesday when he tweeted that he was offered the chance to make his Broadway debut as Spider-Man’s arch-nemesis. “Thank you, Michael Cohl for offering me the role of the Green Goblin on the Broadway production of #spiderman,” the KISS bassist posted to his 573,719 followers. If the 64-year-old rock icon does indeed swap his white and black demon facepaint for the stage villain’s green body makeup, he’ll be replacing Broadway veteran Robert Cuccioli. A rep for the production could not be reached for comment. Simmons may have an opening in his schedule soon: Kiss' 2013 Monster Tour wraps up Nov. 8 in Calgary. For the Queens-raised Simmons, born Chaim Witz, a Broadway run would be a homecoming.